Once you have your business name and logo sorted out, the next thing you’ll need to think about are your website design and your promotional literature. In order to promote your business effectively, corporate or promotional literature will be something you need to put together. It’s the brochure you send out to new enquiries, and a substantial marketing tool for creating the overall impression about how you run things. Having set up your events business with one eye on the competition and how to be different, and choosing a unique name and logo that reflects everything you do accurately, make sure your literature also stands out. But take a leaf out of the books of similar companies. Mystery shopping comes into play here again and it’s worth getting hold of some of the competitor’s literature to see how they do things, decide how effectively they’re delivering the message. You never get a second chance to make a first impression. So make sure your literature says what you want it to say and that it looks right. Get a designer you’re happy with – if you’re hiring without experience of a designer’s work, ask to see examples. Once you have selected the designer you’re happiest with, get some ideas going. Ask for some design ideas, don’t just plump for one look. Try a few different designs out for size and make sure you get at least one other person to look at them with you – not just you and the designer. No good having great literature if it sits in the cupboard. Make sure you use it, send it out, give it to clients and ensure it does its job. It’s not all about the brochure. The most important piece of printed promotional literature is your business card. 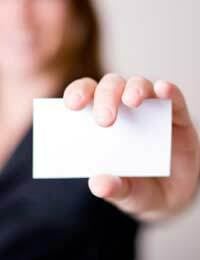 Getting the right design and look for your business card is vital. You will hand these out at every meeting, at trade shows, when networking and even striking up random and fortuitous conversations with people on a day to day basis. You should always, always have them with you, and you should be happy to hand them out to anyone, whether they’re the local florist, or the Queen of England! If your literature looks cheap, so do you. It might seem like a great economy but there is nothing more off-putting that flimsy cards or badly printed stationery. As with anything always get a few quotes. Your designer may be able to ‘print manage’ the job for you, which means shopping around and getting quotes, but also producing the artwork ready for printing and checking the quality of past work. Check with your designer as they may already have a preferred supplier they trust, but again, always get at least one other quote to be sure. As with all these things, get a second, third, fourth opinion! What you like or what you think looks great might not have broad appeal, or it might be that you’re giving out the wrong messages.